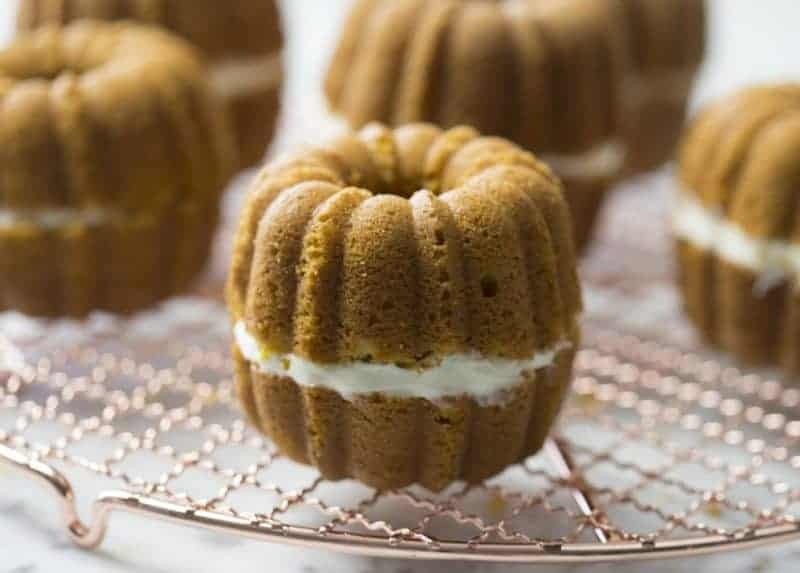 These delicious, delightful, and moist pumpkin cakes are filled with all your favorite fall spices, have a layer of cream cheese frosting inside, and just so happen to look like little pumpkins! Mini-pumpkin bundt cakes filled with Fall spices and cream cheese frosting! I thought these would be really cute as part of a centerpiece at dinner mixed in with real pumpkins and Autumn leaves. Dessert could be right in front of you without you having any idea! Not if I’m on snacking duty. I used real pumpkin stems for these cakes to give the most realistic appearance. I just bought a “Cinderella” pumpkin because they have a long stem then cut a few segments off with some garden clippers. You could also make the stems from some fondant or thick buttercream, but it wouldn’t look quite as real and takes more time. The KEY to decorating these cakes is to chill them after you apply and smooth the buttercream. Once chilled you can do some sculpting and then chill again if the cake softens up too much. The best shaping tool I can recommend is a yogurt container you cut into half circles and rounded points. These pieces will flex and give you better control when shaping and smoothing the pumpkins. I love the way these cakes look “naked”! If you want a cute and FAST version on these then sandwich the bundts together with the cream cheese frosting, and pour a glaze on top. You can finish them off by adding the pumpkin stems or leave as is. Sift powdered sugar and spiced into a bowl. Drizzle in milk and mix until desired consistency is reached. After you cover your cakes in buttercream, I recommend chilling them in the fridge for about 20 minutes so they will be easier to sculpt. If you’re making a bunch of them you can have a little assembly line going with cakes coming into and out of the fridge. Cut bottoms off cakes (less if you want tall pumpkins, more if you want rounder ones). Pipe or smear cream cheese frosting onto the bottom of one mini bundt cake and sandwich together. Add a piece of cake to fill the hole. Scrape ridges into the buttercream. Chill and smooth with your finger or scraper. Top with a stem. I used a real pumpkin stem but you can make one from fondant or even very thick buttercream. If you’ve tried these little cuties then don’t forget to rate the recipe and let me know how you got on in the comments below, I love hearing from you! 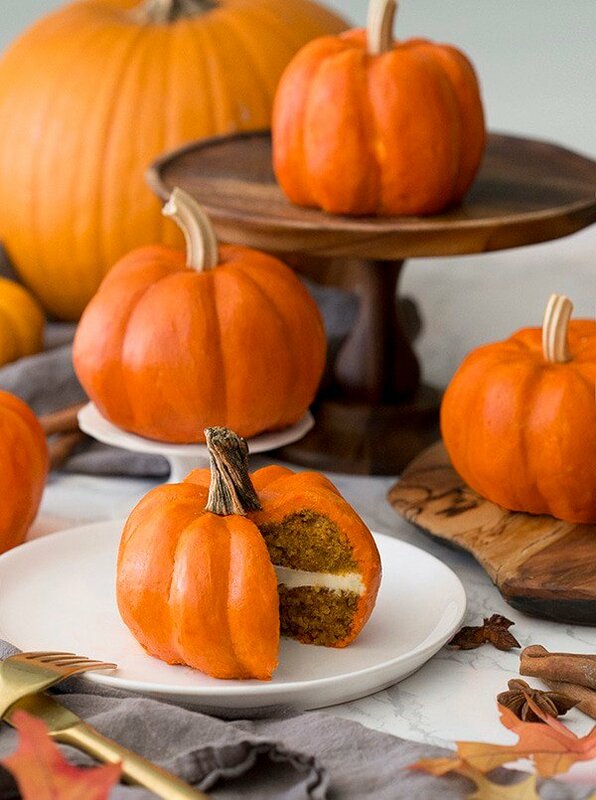 What could be cuter than some trompe l'oeil mini pumpkin cakes? The cakes are moist and full of Fall spices, which are nicely complimented by the cream cheese frosting in the middle. 10 drops orange food coloring Amount of food coloring will depend on brand used and desired color. Preheat oven to 350F. Butter and flour your mini bundt pans. Cream the oils and sugar together, then add in the yogurt and mix until combined. Mix in eggs one at a time, making sure one egg is incorporated into the mixture before adding the next. In a separate bowl sift the remaining dry ingredients together. Mix dry ingredients into the sugar/egg mixture in three batches alternating with the pumpkin puree. Mix until just combined. Spoon or pipe your batter into the pans, filling 2/3 the way up. Bake at 350 for about 20 minutes or until wooden skewer inserted into center comes out clean. Allow to cool in pan for about 10 minutes before inverting onto a wire rack. Beat the cream cheese in a bowl until it is smooth. Add in vanilla and powdered sugar and mix until ingredients are well-incorporated and desired consistency is reached. Beat butter until light and fluffy, add vanilla and then slowly add sugar. Add milk a few tablespoons at a time until desired consistency is reached. You will want a stiffer buttercream so you might be using less milk. Finally add in the food coloring. If you fill the mini bundt forms about half way up there will be enough batter to make about 10 or so pumpkins. I ended up cutting a lot off the bottom from each cake to get a rounder pumpkin. The excess makes a great snack or can be used to make pumpkin cake pops! I used real pumpkin stems for these cakes to give the most realistic appearance. I just bought a "Cinderella" pumpkin because they have a long stem then cut a few segments off with some garden clippers. You could also make the stems from some fondant or thick buttercream, but it wouldn't look quite as real and takes more time. I’m going to try a gluten free flour substitute. Would you recommend adjusting any of the proportions or adding in something like xantham gum as the denser GF flour tends to not hold together as well. I think it should be fine to just substitute it with a GF flour. I have never made a GF recipe and added anything like that. Would this receipe be enough to just make one big pumpkin? I have a recipe to make one big pumpkin! It’s my Pumpkin Bundt Cake!! Can I make these a day before and it would still be fresh? 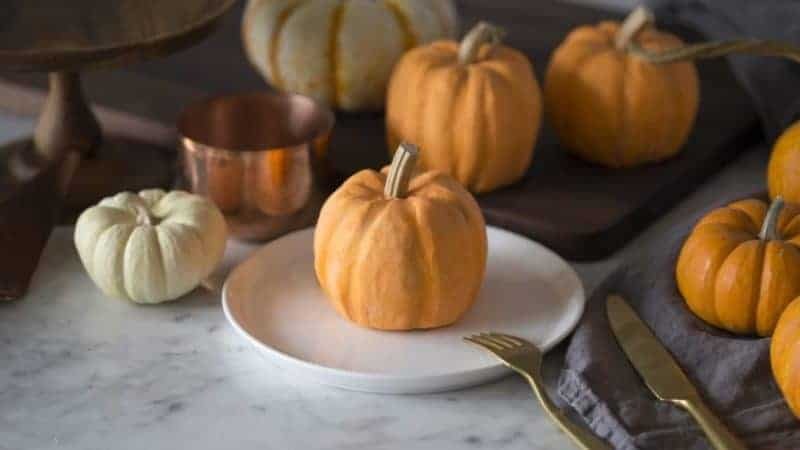 If so how would I store them and if I only wanted to make 1-2 mini pumpkins how can I cut down the ingredients so I don’t waste it all? 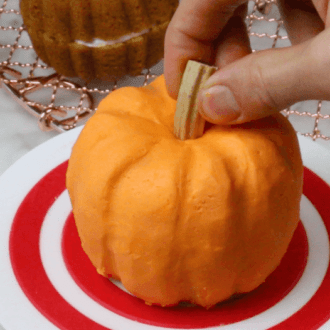 You can make these pumpkins a day before. Make sure to store them in the refrigerator in an airtight container or wrapped up real well in plastic wrap if you haven’t decorated them yet!! If I only want to make 1-2 mini pumpkins how would I cut down the ingredients? Also how would you store these? How would i need to adjust the recipe size in order to make a regular size bundt cake version? I have a recipe to make one big pumpkin! Check out my Pumpkin Bundt Cake!! I believe it would make you about 12 cupcakes!! Hey John, i absolutely love this idea and i can’t wait to try it.. Im gonna do this for Thanksgiving.. Looks like a wonderful recipe and i am so excited.. Thank you! I’m happy you love the recipe, they’re a great addition to your thanksgiving festivities!! I hope you enjoy them! 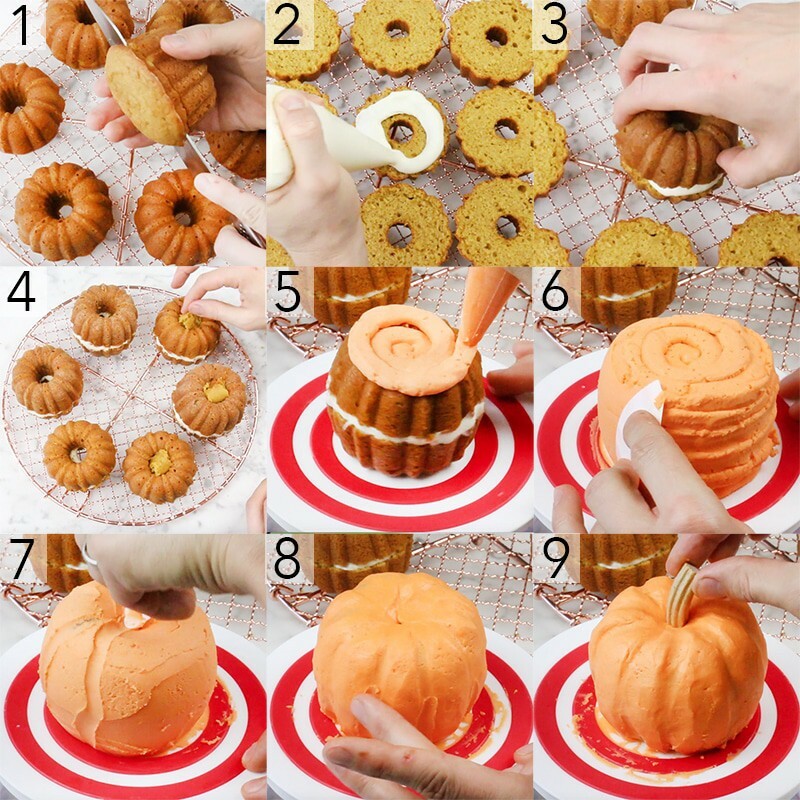 I would like to make big pumpkins (too many to make for hubby’s office party)…how long would I bake it for as I finally get to buy a bundt pan?!!! I have a recipe to make big pumpkins! Check out my Pumpkin Bunt Cake and go by that recipe! These are amazing and so beautiful! I also am extremely appreciative of all the step-by-step pictures you took during the process. Very helpful, because printing the recipe doesn’t allow for the video. These pictures are the next best thing. You also were thoughtful in adding the nutritional information. This entire recipe is absolutely perfect in your information! Thank you so much for all of the detail!!! In regards to the cakes themselves, I made them last night (didn’t do the whole shebang, just the “cute and fast” version) and they were FANTASTIC!!! I’m actually looking forward to making them again and doing the works! Thank you so much for your appreciation!! I’m happy it made the process easier for you and even happier that you enjoyed the mini pumpkins! I am DEFINITELY making these for Thanksgiving! Can you tell me where I can find that “spinning table thing” that you used to decorate the pumpkins?? It’s just a regular old turn table! You can find them online or in a kitchen supply store. What a delightful and clever idea! Now, for me, begins the process of trying to translate the recipe for this lovely confection into one with ingredients (especially substitutes for sugar and white flour) that don’t contribute to major degenerative health problems such as obesity, diabetes, heart disease, arthritis, and cancer, to name but a few–while still retaining the dish’s unique taste, texture, etc. Thats a delicious and clever idea!! Thanks for the tip. I wish I could post a photo. I made this recipe with two bunt cakes instead. I used all the same techniques. Real stem and all. It came out amazing and I used your browned buttercream from the apple cake video instead of regular buttercream. That sounds amazing, WELL DONE!! I am excited to try this recipe, but I do not have a Bundt cake pan. I have looked at some pans online, but it seems there are a couple different sizes. I am not the most visual when it comes to getting an idea of how big the cake will be. What size is your pan? Thanks so much! I would buy a mini bundt cake pan that makes 6 bundt cakes. That is what I use! This looks so real. I just love this. Thank you for sharing at Friday Features. I really want to make these amazing cakes for my nieces 1st birthday party however I don’t have a bundt tin and nowhere in my town sells them/don’t have enough time to order online 🙁 Do you have any advice on how to get the shape? Could I use a normal cupcake tin? You can try to use a normal cupcake pan. They will be a lot smaller and may not be as round. Just sure to refrigerate them as you go so the frosting will become more stiff and easier to shape! You can also cut around the tops of the cupcakes to make them more round. I hope it works out! So frustrated. The cakes look and taste great, but I can’t get the frosting to look right to save my life. Im pretty good at cake decorating too and I don’t know why I’m struggling so badly. Every time I use the “pointed tool” it indents too much and shows the cake underneath. Maybe my buttercream is too thin? I would pipe a thicker layer of buttercream on the pumpkins! Also, place them in the refrigerator so they are easier to sculpt. I just made these little pumpkin cakes today! They are really adorable and I can’t wait to bring them to a gathering of friends tomorrow. Thanks, John, for this wonderful recipe and tutorial. It is my PLEASURE! I’m very glad you made these little pumpkins! What did your friends think? They loved them! They didn’t know at first that they weren’t actually real gourds. I had so much fun making these and everyone has commented on how real they look! It was easier for me to put the cake in the fridge for a few minutes after cooling from baking and then put buttercream on it. This was my first cake sculpting so I had to redo it a few times. I can’t wait to make more today! I’m so happy to hear that! These mini pumpkins are SO much fun to make! My Mom and I had a blast creating these pumpkins! Thanks for the positive feedback! Happy to hear you loved these mini pumpkin cakes and enjoyed making them!! Great idea using the leftovers to make cake pops!! These came out really good. I couldn’t find little pumpkins so I used pecan halves and they looked pretty real! I’m happy you made and enjoyed these mini pumpkin cakes! Good idea using pecans! Thanks for the recipe! 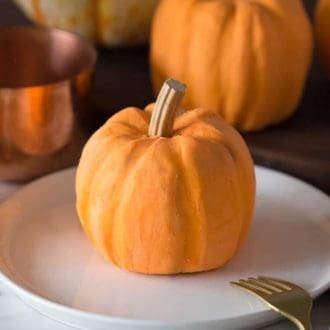 I want to try this out but was wondering, would the same recipe be enough to make two regular sized bunt pans (so one large pumpkin) or would I need to double it? 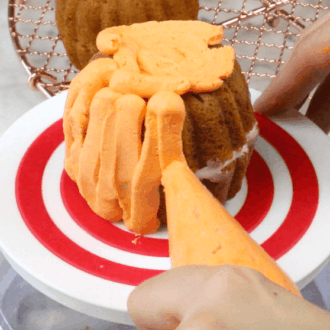 I would follow the recipe for my Pumpkin Bundt Cake! It’s exactly what you need to make one large pumpkin! John, please HELP! How do these store and travel if made ahead of time? Can they be made 5-6 days in advance? Should they be refrigerated? Does the frosting ever harden per say and will the texture remain if traveling through the airport for 6-7 hours? What kind of container would you suggest? I’d really like to bring these along to thanksgiving! I would not recommend traveling with these pumpkins. If you want to give it a shot my best advice would be to put the pumpkins in the refrigerator for about 15 minutes, once the frosting hardens up, wrap each one in plastic wrap and store them in a container where they can not get smushed. If there is a cooler bag you can bring them on the airplane in, I would recommend doing that. There is still a chance the frosting will soften and they will loose their shape. Overall try to keep them sealed tight and refrigerated for as long as possible. That was one of the best video tutorials I have ever seen! Such great explanation and awesome tips and tricks! I am so grateful I came across this recipe, which I am getting ready to make for Thanksgiving dessert. 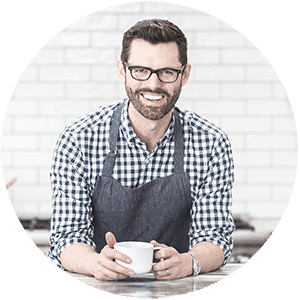 I can’t wait to go through all your other recipes. Thank you again for sharing! That makes me so happy to hear and it is my pleasure!! How did they turn out?